Machu Picchu (From Southern Quechua Machu Pikchu, “Old Mountain”) is a contemporary name that is given to an Inca “llaqta” (Old Andean town) built in the middle of the 15th century on the rocky promontory that unites the Machu Picchu and Huayna Picchu Mountains on the Eastern slope of the Central Cordillera, to the south of Peru and 2,490 meters above sea level (altitude of the main square). Its original name would have been Picchu or Picho. According to documents from the middle of the sixteenth century, Machu Picchu would have been one of the resting places for the Pachacútec (first Inca of Tahuantinsuyo, 1438-1470). However, some of its major constructions and the evident ceremonial character from the main path to the llaqta demonstrated that this was used as a religious sanctuary. Both uses, of the palace and the sanctuary, would not have been incompatible. Some experts seem to have dismissed, by contrast, a supposed military character, through which the popular qualifiers “fortress” or citadel” could have been surpassed. Machu Picchu is considered a masterpiece of both architecture and engineering. Its unique architectural and scenic characteristics, and the veil of mystery that has woven itself around a good portion of the literature published about this site, has made it one of the most popular touristic destinations on the planet. Machu Picchu is on the UNESCO list of World Heritage sites since 1983 as part of a whole cultural and ecological complex known as the Historic Sanctuary of Machu Picchu. On July 7th, 2007, Machu Picchu was declared one of the new seven marvels of the modern world in a ceremony that took place in Lisbon, Portugal, which was attended worldwide by nearly 100 million voters. The drainage infrastructure built by the Incas on Machu Picchu represents a significant achievement for public works. The difficult conditions of the place: almost 2,000 mm of annual rainfall, steep slopes, landslides, and inaccessibility to drainage presented challenges that were overcome with success by the Incas. 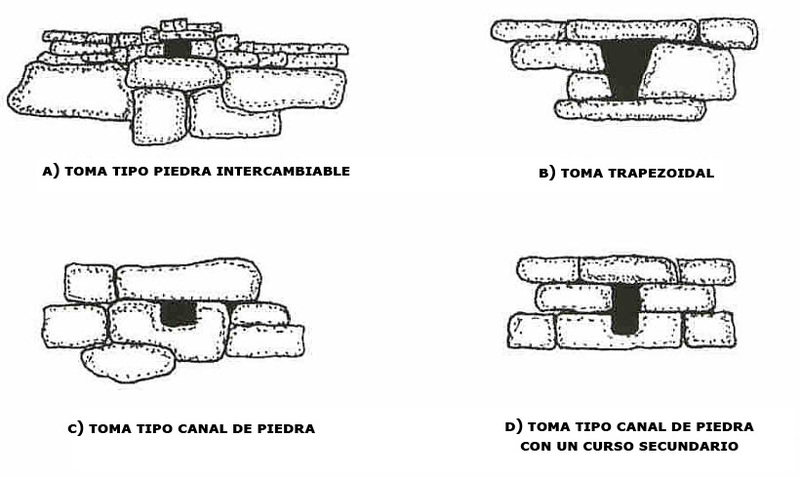 The technical analysis of the Inca drainage works demonstrates that the drainage criterion was reasonable, of exceptional application, and demonstrates that they were good engineers. Proof of the Inca success with these drainage systems falls on the fact that Machu Picchu endured in the jungle for almost 400 years without avail, before its total discovery. There is no better example of ancient civil engineering success than Machu Picchu. It was built by the Native Americans before the arrival of the Spaniards, was essentially abandoned in 1540 AD, and endured for 4 ½ centuries under a thick rainforest until the 20th century. Source: Wright y Valencia. The system of geological faults also influenced the location of the springs located on the northern part of the mountain at 2458 m, since the permeability of it permits the infiltration of rainwater, which emerges into a pond (lake or cocha), providing a perennial water source for the city. With this end the Incas made a drainage system consisting of stone walls 14.6 meters in longitude and 1.4 meters tall. The water filters through the wall and into a stone trench about .8 meters tall. A secondary source enters the canal about 80 meters to the east of the main source. The water flows the length of the canal at 749 meters long, 10-12 centimeters wide, 10-16 centimeters deep, at a 3% slope, with the capacity of 300 I/min. According to the Peruvian archeologist Alfredo Valencia and the North American engineer Kenneth Wright, the location of the canal determined the residential location of the emperor and the general distribution of the city. The sources did not only have a utility role but also a ceremonial role, since the water was considered a principle deity given its importance for agriculture. 16 liturgical springs composed a sacred street located between the Templo del Sol (Sun Temple) and the Palacio Real (Royal Palace). A principle centralized drain, called Foso Seco (The Dry Moat, or Dry Ditch, that separates the agricultural zone from the urban zone. The drainage of the “andenes” with good longitudinal slopes that flow into the longitudinal drain. The subterraneous drainage of the terraces, consisting of pieces of low-quality rocks, overlapped with layers of gravel and sand (see figure). The surface drainage in areas with grass to drain the water runoff from sloping roofs and plazas. 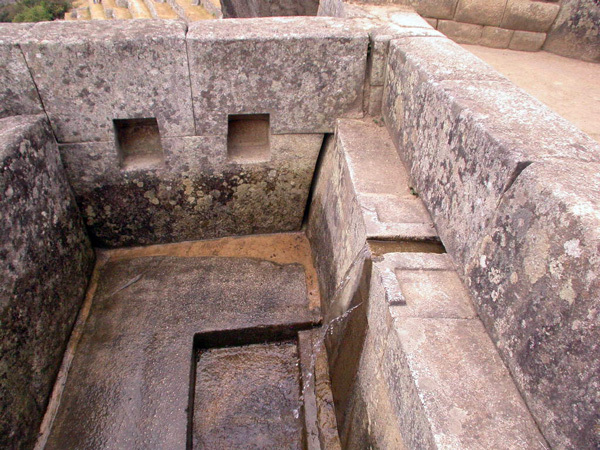 The drainage canals with a combination of stairs, paths, or temple interiors. A deep layer of rock fragments beneath the plazas to allow the runoff of tributary areas. A good system consisting of 129 drainage inlets distributed in retaining walls. Underground caves strategically used for drainage discharge. In 2001, a team of geologists from the Institute of Disaster Prevention Research from Kyoto University, led by Professor Kyoji Sassa, conducted a series of studies determining that the ground beneath the citadel of Machu Picchu is moving. According to Japanese scientists, who buried instruments in the hillsides around the citadel, there are alarming signs that there would be a risk of a landslide down the mountain, as even some of the pieces of Inca masonry work are separating.